1893, the last year before Eton Wick was to have its own Parish Council, independent of Eton (Urban). The village had a gravel dusty through road, no main drainage, gas or electricity. The Church was twenty six years old, but burials in the village had only started the previous April. No weddings were yet licensed here. The Boveney New Town Chapel was seven years old and the village school five years old. 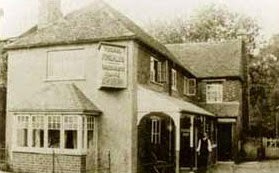 The largest shop was next to the Three Horse Shoes (Ada Cottage) and was currently a bakery, Post Office and general stores owned by a Mr Lovell. The village had four pubs, The Three Horse Shoes, The Grapes, TheGreyhound and The Shepherds Hut. Undoubtedly they have all been altered over the years, and certainly at least two of them had extensive stables and cart sheds. All carting of goods and services was by horse and indeed farms and horses accounted for most of the village workers. There were no phones in the village and Doctors had an appreciable delay in being notified by horse or runner, and getting to the village from Eton. Queen Victoria had four years to go to her Diamond Jubilee and three more before her successor came to the throne Edward the Seventh. The Zulu Wars were over, but unrest in Africa was gradually leading the country into the Boer War of 1899. Villagers kept ducks, chicken, pigs, goats even cows and grew most of their vegetables. The annual event was the Horticultural Show held in the Wheat Butts field and this event was fifteen years old. It was to survive another forty years. Flooding was a common winter occurrence and the early 1890’s saw severe floods culminating in the disastrous 1894 flood which was higher than that of 1947. Piped water had been enjoyed by the village for less than one year. At the best it provided a stack pipe for two or more houses, but it was a godsend after the garden pump and the well. The river was used extensively for horse drawn barges, particularly for timber and general freight movements. Boveney Lock was appreciably smaller and was the site of today’s rollers. The present lock was built three years later in 1896 and of course was manually opened and closed. There were many more trees about, and more open space. No street lighting and household lighting was by candles or oil lamps which provided the dim home lights. Apart from The Walk that was developed about ten years later, the village was much as it is today, in that it was filled with houses. Boveney New Town was new, and several houses were built in Alma Road at this time. The population of Eton Wick with Boveney New Town was about 1000.We had an Isolation Hospital, ten years old, for infectious deceases, that could not be used by Eton Wick residents, and a Sewage Farm that could not be used for our sewage. The Wick had a cricket team established four years and a football club. The village magazine reports a two hour "N****R" Troupe show in 1892 (could be the Eton Wick minstrels) and a Steam Circus was also held on the Common that year. 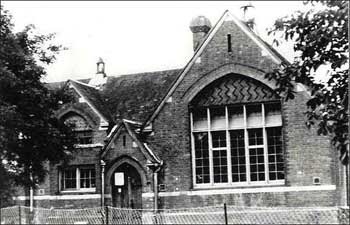 The old school, now redundant for five years served the village as an Institute, and in fact was the only public hall until the present Village Hall opened thirteen years later. The old hall/school measured 29 x 21 feet. Schooling was free and had been for the last three years. Previously pupils had paid 2d per week. Rough justice prevailed and most people used their own yardstick in applying it. There were several ponds of varying sizes and the use of the common was strictly managed. Offences and abuses of the common or Lammas rights were quickly dealt with. The rules as to the use of the common were well defined, as for instance No cattle could be turned out on the commons before six o’clock in the evening of the first day of May. Certain duties fell to particular people, for instance, corpse were laid out by certain women, in the same way new arrivals were dealt with locally. If the church bell tolled during the week, villagers would guess who was dead as three; two or one peel rang out to signify man, women or child. A typical day for a labourer, married and living in Eton Wick 100 years ago would have probably be getting up before daybreak in a cold damp house, dressing in thick warm clothes by candle light, going through the other bedrooms to descend the stairs. Maybe having to go outside to pump water whilst his wife either raked yesterday’s ashes from the fire place or she could be lucky and with the aid of the bellows get yesterday’s hot cinders to spring into life. Whichever there was no hot water until the fire was going well. Then the breakfast would be porridge oats, some home cured bacon and an egg with bread, but some families in Eton Wick breakfast could have been just brad and dripping, because there was poverty here. Nothing was wasted and the ashes from the fire were used to fill the puddles in the garden path which quite often lead to the bucket lavatory at the end of the property or even shared bucket with the neighbours. In all probability he would put on his hobnail boots which could be hardened to the shape of his gait due to the boots being soaked and dried in front of the fire so often. If he was fortunate to have gaiters he would wear them to protect his trousers otherwise it would be a leather strap or a piece of cord to keep his trousers out of the mud. The farm labourer would work at least six full days dawn to dusk, and he would do some hours on Sunday because of the milking and feeding of the animals, for all of this he would get from fifteen shillings to twenty five shillings dependant on his age and job. Winter was a hard season for the labourer, and the winter brought sickness and there was no national health parish relief if one became ill and lost their jobs. To large families this was a constant worry. As Mister left the house, then misses would call the school children to get up. The bedrooms were cold to get dressed in, but perhaps that hurried them along. Many children were used to sleeping two or three to a bed. In the winter months boots could still be wet from yesterday in spite of being stood in front of the kitchen fire overnight. The school bell would be ringing as they hurried along past the main road Pubs to school. Meanwhile, mother would use a stiff broom to sweep the stone floors and maybe using an enamel slop bucket empty the bedroom pots. The contents would almost certainly be emptied in the corner of the garden as with no main drainage it would be silly to fill the lavatory bucket or cesspit without a need. Depending on the day of the week, then so would her days work be governed. Monday was always washday and apart from sickness or young children needing attention washday became a full days labour because cloth was of much heavier weight. Drying of the laundry could be a problem on wet days and the washing would be hung on a clothes horse to dry around the fire. For the labourers family life was a continual make do and mend, Penny washers to mend the leak in the kettle or saucepan, continual darning of socks and clothes. The mending of boots and shoes. Much depended on mum’s ability to repair or bodge to keep things going. Children would be home from school at midday for dinner as school canteens did not exist. If it was raining hard they would need to run home avoiding the numerous puddles. An adequate change of clothing was unaffordable and good waterproof clothing as yet unthought of. The postman would be viewed with anticipation and also apprehension, with no telephones, bad news did not travel fast. Really bad news came by letter edged with black, presumably to prepare the recipient for the contents Death was no stranger one hundred years ago. Child mortality was high and life expectancy was about fifty five years at the time of birth of the average person. Despite this, despite poverty and low wages, custom decreed that if one attended a funeral that person wore black and a black armband be worn afterwards. Horse drawn and persons stopped, hats were removed as the bier or horse drawn hearse passed by. Mourners always walked in procession behind, no irreverent haste as of today. This was our village one hundred years ago and very much like any other rural place in the land.